Our culture thrives on convenience. We’re all searching for the best ways to manage our schedules effectively so we can spend our time doing things we actually enjoy. If you’re anything like me, grocery shopping and food prep is one of the first tasks to go when my calendar fills up. We sacrifice our wellbeing by not resting properly and choosing foods that are detrimental to our health. We grab whatever is available, typically something wrapped in plastic, full of sugar and completely devoid of any real nutrients. It doesn’t have to be this way! There are plenty of options that can provide the rich nutrients our bodies need. Where do we start? We begin by looking at nutrition panels and becoming aware of what our bodies need to feel our best. Sometimes navigating nutrition panels can be confusing, so let us show you exactly what to look for when choosing from the many different types of protein bars for a meal replacement or a quick snack. The term “macronutrient” gets thrown around quite a bit these days. It’s a general term distinguishing types of essential nutrients in all foods that make up the largest portion of our diets. There are three types of macronutrients that work in conjunction with one another to provide the energy our bodies need. Carbohydrates (sugar), protein, and lipids (fats). You’ll find these in varying amounts in every protein bar on the market. The key is finding a bar that balances these three nutrients well. Click here to learn more about macronutrients and their role in maintaining a balanced diet! Carbohydrates are readily available energy sources for your body. There are, however, different types of carbohydrates: complex and simple carbs. Simple, refined carbohydrates are found in soda, fruit juices, and boxed sweets and have been stripped of the majority of their nutrients. In other words, you’re basically eating pure sugar. In order to preserve our health, we need to look for complex carbs that contain high fiber content and digest more slowly. You’ll often find protein bars that claim to be healthy are actually loaded with simple carbs and added sugar. Let me be clear, excess carbohydrates and sugars are not your friends. Most adults and children in the United States eat far too many foods that are loaded with added sugars. JAMA research has shown the effects of eating excess sugar can be damaging to your health and increase your risk of disease. Look for protein bars that maintain a respectable carbohydrate content without skimping on the insoluble fiber that will help keep you full and feed the bacteria in your gut. It’s also wise to look at the ingredients list as well to see what, if any, added sugars, sugar substitutes or sugar alcohols are present. Saturated fats are common in the American diet. According to Harvard health, “saturated” refers to the number of hydrogen atoms surrounding each carbon atom. The chain of carbon atoms holds as many hydrogen atoms as possible – it’s saturated with hydrogens. Sources include animal fat products like red meat, cream, butter and cheese and also plant products like coconut oil. Research has shown varied results on the adverse effects of this type of fat, but it’s a good idea to eat them in moderation. Unsaturated fats have fewer hydrogen atoms bonded to the carbon chains and include monounsaturated and polyunsaturated fats. Monounsaturated fats are dietary fats commonly found in foods like nuts, olive oil, and avocados. Consuming foods rich in these fats has been shown to help lower blood cholesterol levels. Polyunsaturated fats are considered essential fats. They’re fats that your body can’t produce and must be obtained through food and/or supplementation. There are two main types: omega-6 fatty acids and omega-3 fatty acids. Even though some omega-6 is necessary for our bodies to function properly, it’s very important to balance your intake of these fats. As a society, we eat far too many foods high in omega-6 (think almost every processed food in existence, bread, vegetable oil), which in excess can lead to heightened inflammation and may increase your chances of developing chronic diseases. It’s better to eat foods like salmon, mackerel, flaxseeds and chia seeds to increase your omega-3 intake. Omega-3’s have some pretty incredible benefits ranging from improving the risk of heart disease, fighting inflammation, improving joint health and improving brain health. Not all proteins are created equal. You’ll find whey, pea, or egg white protein in most bars. If you are concerned about absorption or bioavailability of your protein, whey protein is going to be your best option. If you have an allergy or your stomach has difficulty processing the whey, plant proteins and egg white proteins are a respectable source. With that being said, grass-fed whey is king. Grass-fed cows are obviously allowed to graze and eat naturally grown grass instead of soy and corn products. This makes for a healthier and happier cow and a cleaner whey product. Grass-fed products contain higher quantities of healthy fats (including omega-3), vitamins and minerals and evidence suggests it is less likely to contain harmful bacteria. Sourcing ingredients are important, so whenever possible choose organic grass-fed whey products. Balanced macronutrients mean nothing if the ingredients providing the nutrition are tainted themselves. It’s typical to see companies touting the purity of their ingredients by saying organic this and non-GMO that, but what does this actually mean for your health? Does slapping this statement on a bar automatically make it better for you? In its simplest definition, organic ingredients are products that are grown without the use of pesticides and chemical fertilizers. The benefits of consuming ingredients that haven’t been sprayed with chemicals and pesticides are self-explanatory, but it’s often not on the radar for those of us who are on a budget. Buy organic when you can, it’s always the better choice. Hand in hand with organic ingredients are non-GMO ingredients. The Non-GMO Project defines a GMO as “living organisms whose genetic material has been artificially manipulated in a laboratory through genetic engineering. This creates combinations of plant, animal, bacteria, and virus genes that do not occur in nature or through traditional crossbreeding methods.” Practical uses of GMOs include increasing the shelf life of your food and making crops resistant to herbicides, but we’re still unaware of the long-term effects on humans. It’s important to search for products that are labeled non-GMO. Whole food ingredients are another important factor when choosing a protein or meal replacement bar. There are many bars on the market that will tout incredible macronutrients, but when you look more closely at the ingredients you can barely even pronounce half of them. Look for bars that contain whole food ingredients like nuts or nut butter, honey or natural sugars, coconut oil or other healthy fat sources, and natural fibers like tapioca fiber. What is the Healthiest Protein Bar? Now that we’ve covered all the do’s and don’ts and you’re probably wondering if any product could ever meet these standards. Well, you’re in luck. There are many affordable options that meet these requirements and you can find them right here at Nutrition World. Here are a few of my favorite options that I believe to be amongst the healthiest protein bars on the market. 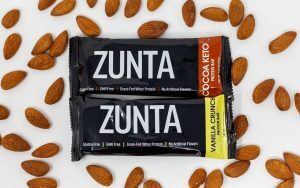 The ZUNTA bar is a balanced macronutrient bar that boasts mostly organic and 100% non-GMO ingredients. These contain grass-fed whey and are currently available in two flavors: cocoa and vanilla. Not only are they a nicely balanced and nutrient dense, but they contain ingredients that serve a purpose. You’ll find almond butter, pink Himalayan salt, tapioca fiber, cocoa nibs, and chia seeds. In other words, whole foods products you can pronounce. Click here to shop for ZUNTA bars! Bhu is a great company offering mostly vegan protein bars, although they do have three varieties of grass-fed whey protein bars. A bit on the smaller side, they pack a ton of whole food ingredients in each and every bar and make an excellent healthy snack. These are a low carb/sugar option and they do offer a few keto bars as well. Everything they produce is fully non-GMO and mostly organic. Be sure to try the keto chocolate chip cookie dough bar! Click here to shop for Bhu bars! The same company that brought us the famed “Bulletproof Coffee” also has some great protein bars. Slightly different from the rest of the lineup, Bulletproof bars feature grass-fed collagen protein. The most abundant protein located in the body, collagen is found in connective tissue structures like our skin, hair, and joints. Besides the grass-fed collagen, Bulletproof bars contain organic cashews, chicory root fiber, and Brain Octane, a proprietary MCT oil to get you those healthy fats. Sweetened with stevia, these are a tasty treat that anyone can enjoy. Click here to shop for Bulletproof bars!